So many dragonflies…so little time. Although I have returned from my recent trip to Brussels, Belgium, I still have photos to share of dragonflies that I saw while I was there. I guess that I consider the species that I observed to be “exotic” and special because they were new to me, though many of them are probably quite common in Brussels. 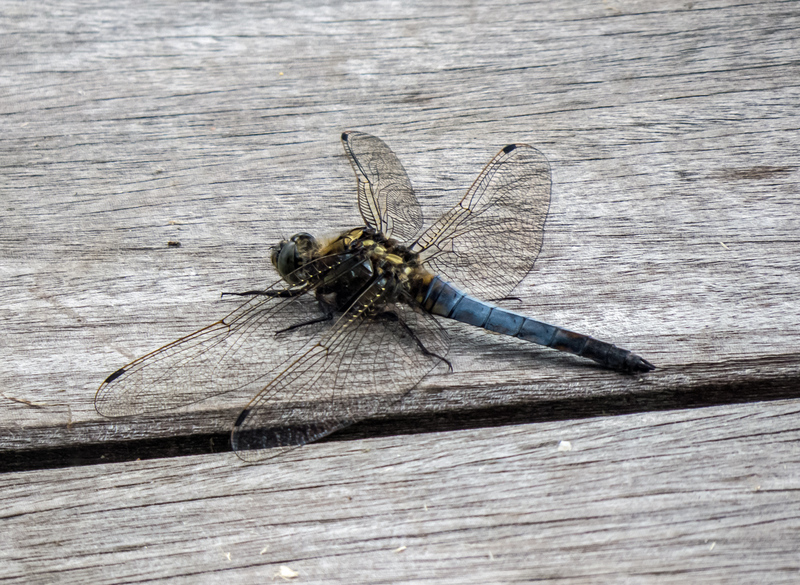 As I watched the Black-tailed Skimmers, I noticed some differences compared to the Blue Dashers. 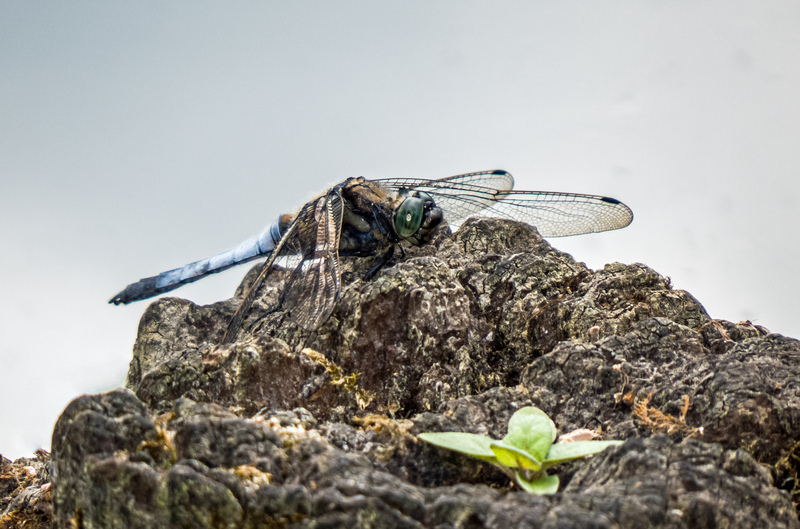 The bodies of the Black-tailed Skimmers appeared to be larger and broader; their eyes seemed greener; and they seemed to spend more time perching flat on the ground rather than on the tips of vegetation. I thought about posting only the first image, my favorite, because it has a kind of artistic appeal to me. I like the low angle that I chose and the vegetation growing in the foreground out of what appears to be a rock, but is actually the deteriorated wood of a piling at the edge of the water. Ultimately I decided to share some additional shots that give you a more complete view of this beautiful “new” dragonfly species. UPDATE: A sharp-eyed viewer from the United Kingdom noted that the dragonfly in the second photo appears to be a different species than the ones in the other photos. I did some additional checking and agree with him that it is probably a male Scarce Chaser (Libellula fulva), not a Black-tailed Skimmer. Thanks for the help, blhphotoblog, and others should check out his wonderful blog Butterflies to Dragsters for some wonderful photos. I’m no expert Mike but image 2 looks a lot like a male scarce chaser (Libellula fulva) but it could just be the angle. 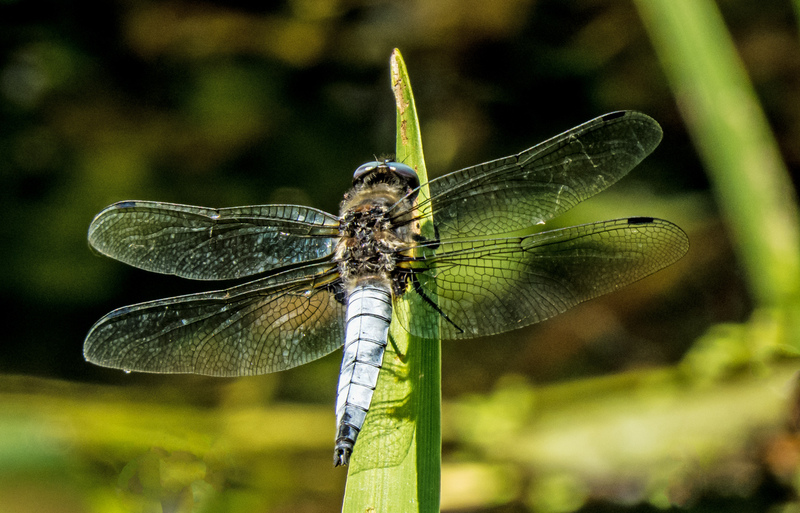 The body looks flatter and shorter, the black on the tip is reduced and it’s unusual for Black Tailed skimmers to perch like that on vegetation, they prefer bare ground. The only other possibility is Broad Bodied Chaser but they have clear yellow markings on the side of the body, but as I said I’m no expert. After i read the post to Benjamin, he carefully examined each enlarged photo. His conclusions : #1 “The eyes are a pretty green and I like the way he has his wings.” #2 “His tail is shorter and fatter, but his wings are nice.” #3 “He has a nice blue tail with a black end on it. I love his wings with the stigmas.” I said “stigmas?” and he pointed to the black areas on the wing and said : “Don’t you remember these?” I didn’t and wonder how did Benjamin remember! Thank-you, Mr. Mike!! I like the 2nd shot the best! Love how the wings show up so nicely.